$24/night for the first dog and $17/night for the second dog staying in the same run. Rizzy having fun in Qozy Quarters! Hound Hall includes 10 indoor/outdoor runs, 2 extra large indoor/outdoor runs and 12 small indoor runs. Hound Hall does have air conditioning as of June 21, 2018. During the winter we use in-floor heating to keep them warm! 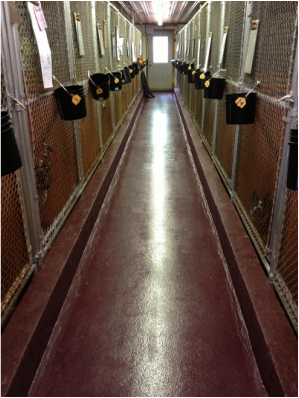 Regular indoor/outdoor = $22/night for the first dog and $17/night for the second dog staying in the same run. Extra Large indoor/outdoor = $24/night for the first dog and $18/night for the second dog staying in the same run.